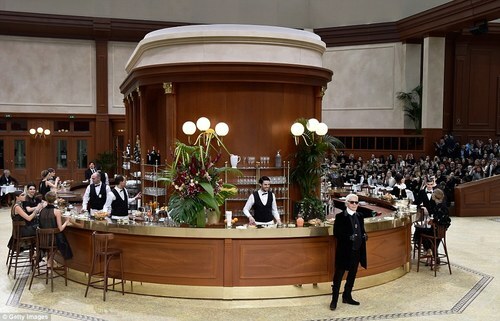 The brasseries in Paris are ideal for people-watching but when reinvented by Karl Lagerfeld for the Chanel show, this one featured friendly and impeccably dressed waiting staff and Chanel-clad patrons. Oh, and aptly named "Brasserie Gabrielle" after the brand's founder, Gabrielle (Coco) Chanel. Photos from around the web showcased a beautiful, chic and girly presentation that captured the clothes and legacy of the brand impeccably. Then, the duo from Zoolander (Ben Stiller and Owen Wilson) closed out the Valentino runway show, to promote the launch of Zoolander 2.